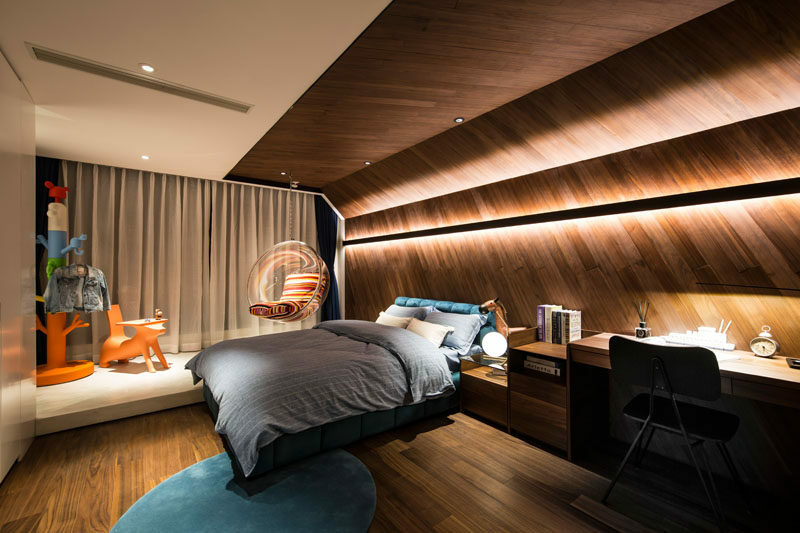 PRISM Design, together with Mori Design, have recently completed a villa in Nantong, China, and as part of the design, they created a children’s bedroom that features a unique wrap-around accent wall that continues onto the ceiling. The wood accent wall creates a backdrop for the bed and adds a sense of warmth to the room, while a horizontal black line ties in with the black chair and light on the desk. The wrap-around accent wall, which has the wood installed on a diagonal for added interest, also hides lighting that when turned on at night, creates soft ambient lighting making the room calm and relaxing.